Do you guys have a lot of scents that evoke particular memories? I read about it all the time, you know what I’m talking about, a character in a book is immediately transported back to a long ago place and time just from the whiff of a perfume or a flower or a loaf of bread or something. I can’t say that my scent memory bank is very full but I had a moment yesterday that was unexpected. 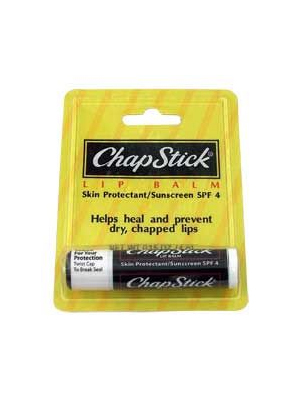 I bought a big pack of Chap Stick at Sam’s Club, the kind that has tubes of different “flavors.” When I opened it up, picked up the Original Scent Chap Stick, I swear, I had to turn around and make sure my Dad wasn’t in the room with me. It wasn’t some overwhelming transport back to childhood kind of thing, just a quick little thing, and of course I had to start wondering if Dad still even uses that “flavor” of Chap Stick. How about you? Got any scents that evoke particular memories for you? And yes, I’m totally in work-avoidance mode, why do you ask? NO ONE is in work avoidance mode today like I am! As for scent memories, my Dad used to wear English Leather aftershave. It never occurred to me that he only wore it when we were going somewhere so I always thought that I just got carsick easily. It was really just my first perfume allergy! The scent of that cologne makes me want to immediately vomit……nothing personal to my Dad though! Since I don’t have much of a sense of smell now, I suppose I don’t really have many scent memories. The scent of the Butterfly Bush blooms. When I was a child, my grandmother had these growing in the back of her garage. The first time I walked past a flowering Bush in a nursery, I was hit with all sorts of memories and feelings. I have a couple of them in my yard now. I love the perfume of those flowers! My dad’s after shave, not sure what it is, but I know it when I smell it and he’s been gone 25 years. Ahhhh happy smell indeed. Oh and Dow bathroom cleaner makes me nauseous every time ….cleaned a nasty dead pill bug pile up with it behind a water heater once…27 years ago. Ick! Peonies and lilacs remind me of my Grandma Mabel. Also, I need to see if they still make Camay soap. My mother always thought it was the best for dry skin and I’ve been thinking about it for some odd duck reason lately. Thinking that I NEED Camay soap. Have you noticed, stores sell fewer and fewer bars of soap, everyone uses liquid soap. Yes, I’m home early from work. Sneezing my fool head off. Emptying tissue boxes. Probably was driving my co-workers crazy. Guess what, she was always my favourite teacher!!!! I think I ment Anaesthetic…… lol….. I have lots of scent memories…and I have even more Deja Vu memories where I will be doing something (usually cooking, cleaning or laundry related) the exact same way as my mom or grandma would…it’s a strange, but comforting feeling. Arid deoderant sends me to Seattle, WA when I was in the 6th grade and we were living in an apt in downtown Seattle in order to be near Daddy while he was on a few months duty in Seattle. He was a Naval officer and we traveled and moved a lot when I was a child. I’m sure there are more memories. But, that one is really clear. I have lots of these memories. The smell of gardenias always makes me think of my mom, who wore White Shoulders perfume, which smells like gardenias. Old Spice reminds me of my dad. English Leather, my brother. Musk for Men, my first real boyfriend. The fragrance of lilacs reminds me of the summers spent beneath huge lilac bushes with my best friend and kindergarten crush.